Captain Charles Thomas Rice, a Civil War veteran, arrived in Riverside with his family in 1880. His wife, Emma, was the sister of Clara Van de Grift, who arrived in Riverside the same year. The Van de Grifts were the in-laws of author Robert Louis Stevenson, through Clara’s husband, Jacob, whose sister, Fanny, married Stevenson. Rice went to work with Augustus Boggs, architect and contractor, and helped build the first Boggs family home on Market at Ninth Street. As a contractor, Rice built the home of John T. Jarvis on Twelfth Street at Redwood Drive and supervised the construction of the Lorenzo Scranton home at 4595 University Avenue. He was a carpenter for the Ames-Westbrook house at Brockton Avenue and Homewood Court. Captain Rice gave his name to Rice Road which commemorates Rice’s pioneering effort to encourage the use of terraces to plant citrus. Terracina Drive is the location of his experiment on the south side of Tequesquite Arroyo. 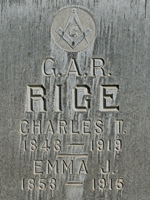 Captain Rice was one of the 31 founding members of the Grand Army of the Republic Riverside Post 118, organized in 1886. Rice was post commander in 1890-1891 and commander of the Department of California and Nevada for one term. He died in a veteran’s hospital in Los Angeles at age 75 in 1919. The Rice’s daughter, Anna, married Joseph Bordwell, and their son and Rice’s grandson, Alden Bordwell, became a beloved doctor in Riverside. Bordwell Park is named for Dr. Bordwell, and he is the father of Little League baseball in the city.